Northwest Territories RCMP announced Monday afternoon that they had charged 15 people in connection to a year-long investigation into Yellowknife's cocaine trade, named "Project Gloomiest." According to the release, the investigation focused primarily on 23-year-old Toufic Chamas, but "the investigation quickly expanded to include several other people," as well as a separate cocaine trafficking network. Chamas, of Edmonton, is facing four counts of trafficking cocaine and one count of unlawful possession of a firearm in connection with the investigation. He is also facing several charges in relation to a Thanksgiving weekend firearms theft in Yellowknife, and is awaiting sentencing for flying a drone in airspace where planes take off and land in the city. Those incidents are not related to the charges Chamas now faces, said Staff Sgt. Dean Riou of the Northwest Territories RCMP Federal Investigations Unit in an interview with CBC News. "Our investigation was done very covertly, a lot of times we don't even tell other police officers what we're working on, just to maintain the integrity of our investigation," he said. "Basically Mr. Chamas came into contact with other police officers doing other investigations." Police recovered over 1,425 grams of what is suspected to be cocaine as a result of the investigation, as well as two firearms, the release states. RCMP say they began the investigation after receiving information from Canada's financial intelligence agency — Financial Transactions and Reports Analysis Centre of Canada — regarding suspicious transactions believed to be linked to the drug trade. 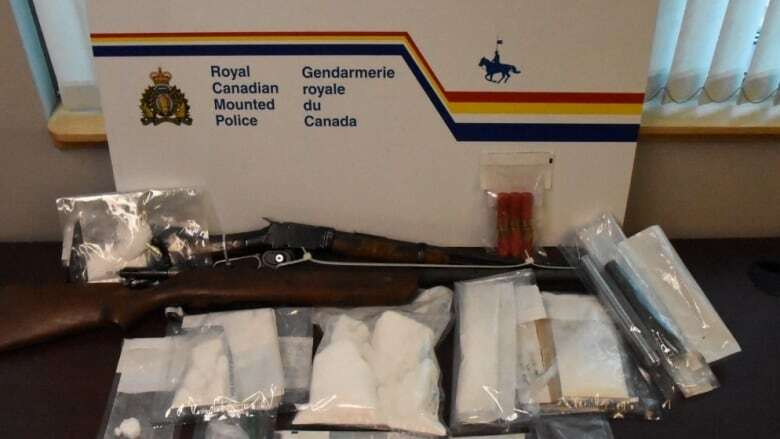 Other RCMP drug investigations over the years have been dubbed "Gloom" and "Gloomier," the use of the term "Gloomiest" follows that naming pattern, but this latest investigation is independent of any previous investigation, Riou explained. Andrew Rheaume, 24, charged with possession of cocaine for the purpose of trafficking. Clayton Christensen, 40, charged with unlawful transfer of a firearm. Toni Tobac, 27, charged with two counts of trafficking cocaine. Brandon Topilikon, 26, charged with trafficking cocaine. Caitlin Stewart, 27, charged with three counts of trafficking cocaine. Julie Carter, 33, charged with three counts of trafficking cocaine. An Edmonton resident has also been charged with two counts of trafficking cocaine. All of the arrested individuals have been released for court at later dates, according to the release. Police also announced arrest warrants have been issued on trafficking charges for seven other individuals. In in the release, Riou said that several of the individuals facing charges are alleged to have trafficked "substitute substances that they represented as cocaine." "This was a very challenging investigation, compounded by the fact that many of the people we encountered were from out of town, and operated under pseudonyms. Extensive efforts were made to confirm the identity of these people who came to Yellowknife to exploit our most vulnerable citizens," he said in the release.